Chili’s: Free Chips and Queso! 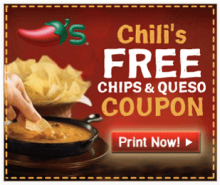 Right now you can get a coupon for FREE chips and queso from Chili’s just by signing up for their email club. I signed up long ago and get great offers. Sign up for your free chips and queso appetizer from Chili’s now.